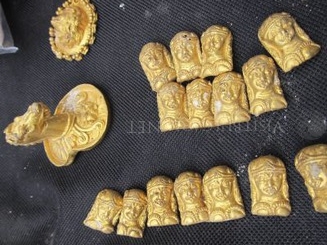 Bulgarian archaeologists unearthed ancient golden artefacts, including bracelets with snake heads, a tiara with animal motifs and a horse head piece during excavation works at a Thracian tomb in northern Bulgaria. The golden artefacts are dated back to the end of the fourth or the beginning of the third century BC and were found in the biggest of 150 ancient tombs of a Thracian tribe, the Getae, that was in contact with the Hellenistic world. The findings also included a golden ring, 44 applications of female figures as well as 100 golden buttons. “These are amazing findings from the apogee of the rule of the Getae,” said Diana Gergova, head of the archaeologist team at the site of the ancient Getic burial complex situated near the village of Sveshtari, some 400 km northeast from Sofia.